For centuries, the diagnosis and treatment of deep neck space infections have challenged physicians and surgeons. The complexity and the deep location of this region make diagnosis and treatment of infections in this area difficult. These infections remain an important health problem with significant risks of morbidity and mortality. See the image below. CT scan of the neck demonstrating left peritonsillar abscess. See 10 Patients with Neck Masses: Identifying Malignant versus Benign, a Critical Images slideshow, to help identify several types of masses. In the past, infections of the deep neck spaces were associated with high rates of morbidity and mortality. The overwhelming complication rate of the past has been reduced with the advent of modern microbiology and hematology, the development of sophisticated diagnostic tools (eg, CT, MRI), the effectiveness of modern antibiotics, and the continued development of medical intensive care protocols and surgical techniques. Complex anatomy: The anatomy of the deep neck spaces is highly complex and can make precise localization of infections in this region difficult. Deep location: The deep neck spaces are located deep within the neck. This makes diagnosis of infections difficult because they are often covered by a substantial amount of unaffected superficial soft tissue. Deep neck infections may be difficult to palpate and impossible to visualize externally. Access: Superficial tissues must be crossed to gain surgical access to the deep neck spaces, placing all of the intervening neurovascular and soft tissue structures at risk of injury. Proximity: The deep neck spaces are surrounded by a network of structures that may become involved in the inflammatory process. Neural dysfunction, vascular erosion or thrombosis, and osteomyelitis are just a few of the potential sequelae that can occur with involvement of surrounding nerves, vessels, bones, and other soft tissue. Communication: The deep neck spaces have real and potential avenues of communication with each other. Infection in one space can spread to adjacent spaces, thus gaining access to increasingly larger portions of the neck. In addition, certain deep neck spaces extend to other portions of the body (eg, mediastinum,  coccyx), placing areas outside of the head and neck at risk of involvement when these spaces are involved. No accurate estimate of the overall frequency of deep neck space infections in the United States or worldwide presently exists. However, to assume that the incidence of infection in the United States is significantly lower than that of countries in which patients do not benefit from early medical intervention is reasonable. The complication rate is also likely to be greater in areas without wide access to modern medical treatment, including antibiotics, imaging modalities, and intensive care support. As many as 20-50% of deep neck infections have no identifiable source. Other important considerations include patients who are immunosuppressed because of human immunodeficiency virus (HIV) infection, chemotherapy, or immunosuppressant drugs for transplantation. These patients may have increased frequency of deep neck infections and atypical organisms, and they may have more frequent complications. Spread of infection can be from the oral cavity, face, or superficial neck to the deep neck space via the lymphatic system. Lymphadenopathy may lead to suppuration and finally focal abscess formation. Infection can spread among the deep neck spaces by the paths of communication between spaces. Direct infection may occur by penetrating trauma. Once initiated, a deep neck infection can progress to inflammation and phlegmon or to fulminant abscess with a purulent fluid collection. This distinction is important because the treatment of these 2 entities is very different. The microbiology of deep neck infections usually reveals mixed aerobic and anaerobic organisms,  often with a predominance of oral flora. Both gram-positive and gram-negative organisms may be cultured. Group A beta-hemolytic streptococcal species (Streptococcus pyogenes), alpha-hemolytic streptococcal species (Streptococcus viridans, Streptococcus pneumoniae), Staphylococcus aureus, Fusobacterium nucleatum, Bacteroides melaninogenicus, Bacteroides oralis, and Spirochaeta, Peptostreptococcus, and Neisseria species often are found together in various combinations. Pseudomonas species, Escherichia coli, and Haemophilus influenzae are occasionally encountered. A study by Asmar of retropharyngeal abscess microbiology demonstrated polymicrobial culture results in almost 90% of patients. Aerobes were found in all cultures, and anaerobes were found in more than 50% of patients. Other studies have shown an average of at least 5 isolates from cultures. A detailed anatomic description of the major facial and deep neck spaces is beyond the scope of this article. However, a thorough knowledge of this anatomy is necessary for accurate diagnosis and treatment of these infections. The deep neck spaces are formed by fascial planes, which divide the neck into real and potential spaces. Two main fascial divisions exist, the superficial cervical fascia and the deep cervical fascia. Superficial cervical fascia: The superficial fascia, which lies just deep to the dermis, surrounds the muscles of facial expression. It includes the superficial musculoaponeurotic system (SMAS) and extends from the epicranium to the axillae and chest. The space deep to this layer contains fat, neurovascular bundles, and lymphatics. It does not constitute part of the deep neck space system. Deep cervical fascia: The deep cervical fascia encloses the deep neck spaces and is further divided into 3 layers, the superficial, middle, and deep layers of the deep cervical fascia. The superficial layer of the deep cervical fascia is an investing fascia that surrounds the neck. It encompasses the sternocleidomastoid muscle, trapezius, muscles of mastication, and submandibular and parotid glands. It is limited superiorly by the nuchal ridge, mandible, zygoma, mastoid, and hyoid bones. Inferiorly, it is bounded by the clavicles, sternum, scapula, hyoid, and acromion. It contributes to the fascia covering the digastric muscle and to the lateral aspect of the carotid sheath. In its course from the hyoid bone to the medial table of the ramus of the mandible, it envelops the anterior belly of the digastric muscle and forms the floor of the submandibular space. Laterally, this fascia helps to define the parotid and masticator spaces. The middle layer of the deep cervical fascia has 2 divisions, muscular and visceral. The muscular division surrounds the strap muscles (ie, sternohyoid, sternothyroid, thyrohyoid, omohyoid) and the adventitia of the great vessels. The visceral division surrounds the constrictor muscles of the pharynx and esophagus to create the buccopharyngeal fascia and the anterior wall of the retropharyngeal space. Both the muscular and visceral divisions contribute to the formation of the carotid sheath. The middle layer also envelops the larynx, trachea, and thyroid gland. It attaches to the base of the skull superiorly and extends inferiorly as low as the pericardium via the carotid sheath. The deep layer of the deep cervical fascia is also subdivided into 2 divisions, prevertebral and alar. The prevertebral division adheres to the anterior aspect of the vertebral body and extends laterally to the transverse processes of the vertebrae. The alar division lies between the prevertebral division and the visceral division of the middle layer and defines the posterior border of the retropharyngeal space. It surrounds the deep neck muscles and contributes to the carotid sheath. Posteriorly, the muscular division of the middle layer of the deep cervical fascia fuses with the alar division of the deep layer of the deep cervical fascia at the level of thoracic vertebrae 1-2 (T1-T2). Within the deep neck are 11 spaces created by planes of greater and lesser resistance between the fascial layers. These spaces may be real or potential and may expand when pus separates layers of fascia. The deep neck spaces communicate with each other, forming avenues by which infections may spread. These spaces are described briefly. The parapharyngeal space (ie, lateral pharyngeal space, pharyngomaxillary space, pterygomaxillary space, pterygopharyngeal space) occupies an inverted pyramidal area bounded by multiple components of the fascial system. The inferior limitation of this space is the lesser cornua of the hyoid bone; the entire space is situated superiorly with respect to the hyoid. The superior margin of the space is the skull base. Its medial boundary is the visceral division of the middle layer of deep cervical fascia around the pharyngeal constrictor and the fascia of the tensor and levator muscles of the velum palatini and the styloglossus. Laterally, the space is defined by the superficial layer of the deep cervical fascia that overlies the mandible, medial pterygoids, and parotid. The posterior border is formed by the prevertebral division of the deep layer and by the posterior aspect of the carotid sheath at the posterolateral corner. The anterior boundary is the interpterygoid fascia and the pterygomandibular raphe. The parapharyngeal space can be subdivided into compartments by a line extending from the medial aspect of the medial pterygoid plate to the styloid process. The internal maxillary artery, inferior alveolar nerve, lingual nerve, and auriculotemporal nerve comprise the anterior (ie, prestyloid) compartment. Infections in this compartment often give significant trismus. The posterior (ie, poststyloid) compartment contains the carotid sheath (ie, carotid artery, internal jugular vein, vagus nerve) and the glossopharyngeal and hypoglossal nerves, sympathetic chain, and lymphatics. It also contains the accessory nerve, which is somewhat protected from pathologic processes in this region by its position behind the sternocleidomastoid muscle. The parapharyngeal space connects posteromedially with the retropharyngeal space and inferiorly with the submandibular space. Laterally, it connects with the masticator space. The carotid sheath courses through this space into the chest. This space provides a central connection for all other deep neck spaces. It is directly involved by lateral extension of peritonsillar abscesses and was the most commonly affected space before the advent of modern antibiotics. Infections can arise from the tonsils, pharynx, dentition, salivary glands, nasal infections, or Bezold abscess (ie, mastoid abscess). Medial displacement of the lateral pharyngeal wall and tonsil is a hallmark of a parapharyngeal space infection. Trismus, drooling, dysphagia, and odynophagia are also commonly observed. The retropharyngeal space is sometimes considered a third medial compartment within the parapharyngeal space because the 2 communicate laterally. This space lies between the visceral division of the middle layer of the deep cervical fascia around the pharyngeal constrictors and the alar division of the deep layer of deep cervical fascia posteriorly. It extends from the skull base to the tracheal bifurcation around T2 where the visceral and alar divisions fuse. It primarily contains retropharyngeal lymphatics. Infection may enter this space directly, as with traumatic perforations of the posterior pharyngeal wall or esophagus, or indirectly, from the parapharyngeal space. More than 60% of retropharyngeal abscesses in children are caused by upper respiratory tract infections, whereas most infections in adults in this region are caused by trauma and foreign bodies. Other common sources of infection in the retropharyngeal space are the nose, adenoids, nasopharynx, and sinuses. Infections of this space may drain into the prevertebral space and follow that space into the chest. Mediastinitis and empyema ensue. Abscess in this space may push forward, occluding the airway at the level of the pharynx. It may appear as anterior displacement of one or both sides of the posterior pharyngeal wall because of involvement of lymph nodes, which are distributed lateral to the midline fascial raphe. Retropharyngeal lymph nodes tend to regress by about age 5 years, making infection in this space much more common in children than adults. The most common etiology of prevertebral abscesses (other than extension from other sites) is trauma, particularly iatrogenic instrumentation. Involvement of the vertebrae can lead to osteomyelitis and spinal instability. The danger space is immediately posterior to the retropharyngeal space and immediately anterior to the prevertebral space, between the alar and prevertebral divisions of the deep layer of the deep cervical fascia. It extends from the skull base to the posterior mediastinum and diaphragm. Laterally, it is limited by the fusion of the alar and prevertebral division with the transverse processes of the vertebrae. Some authors consider the danger space a component of the prevertebral space. Infections in this region may be extensions of retropharyngeal, parapharyngeal, or prevertebral infections. Spread within the danger space tends to occur rapidly because of the loose areolar tissue that occupies this region. This spread can lead to mediastinitis, empyema, and sepsis. The masticator space is situated laterally to the medial pterygoid fascia and medially to the masseter muscle. It is bounded by the sphenoid bone, the posterior aspect of the mandible, and the zygomatic arch. It lies inferiorly to the temporal space and is anterolateral to the parapharyngeal space. It contains the masseter, pterygoids, ramus and body of the mandible, temporalis tendon, and the inferior alveolar vessels and nerve. Infection in the masticator space may spread to the parapharyngeal, parotid, or temporal space. Infections here may be a result of dental infections, particularly of the third mandibular molars, and have reportedly occurred from removal of suspension wires following reduction and fixation of facial fractures. Trismus is commonly seen in the initial presentation and may be a long-term sequela. The submandibular space is bounded inferiorly by the superficial layer of the deep cervical fascia extending from the hyoid to the mandible, laterally by the body of the mandible, and superiorly by the mucosa of the floor of mouth. It is considered to have 2 subdivisions, the sublingual and submaxillary spaces, which are divided by the mylohyoid muscle. The sublingual space contains the sublingual gland, hypoglossal nerve, and Wharton duct. It is in continuity with the submaxillary space via the posterior margin of the mylohyoid muscle, around which pus can readily tract. The submaxillary division is further subdivided by the anterior belly of the digastric into a central submental compartment and a lateral submaxillary space. Infection in the submandibular space may be secondary to oral trauma, submaxillary or sublingual sialadenitis, or dental abscess of mandibular teeth. The term Ludwig angina describes inflammation and cellulitis of the submandibular space, usually starting in the submaxillary space and spreading to the sublingual space via the fascial planes, not the lymphatics. As the submandibular space is expanded by cellulitis or abscess, the floor of the mouth becomes indurated, and the tongue is forced upward and backward, causing airway obstruction. Ludwig angina does not require the presence of a focal abscess. It typically includes bilateral involvement and manifests with drooling, trismus, pain, dysphagia, submandibular mass, and dyspnea or airway compromise caused by displacement of the tongue. This is a life-threatening condition that requires tracheostomy for airway control. Before antibiotics, the mortality rate of Ludwig angina was 50%. With modern antimicrobial and surgical therapies, the mortality rate is less than 5%. Submandibular space infections may spread to the parapharyngeal space or retropharyngeal space. The carotid (ie, visceral vascular) space is a potential space within the carotid sheath containing the carotid artery, internal jugular vein, vagus nerve, and sympathetic postganglionic fibers. This space may be affected indirectly from spread of infection from the surrounding parapharyngeal space or directly by injection of drugs in those who abuse IV drugs. The resulting jugular vein thrombophlebitis sends septic emboli to the heart and lungs. The carotid artery may thrombose, form an aneurysm, or erode and rupture. 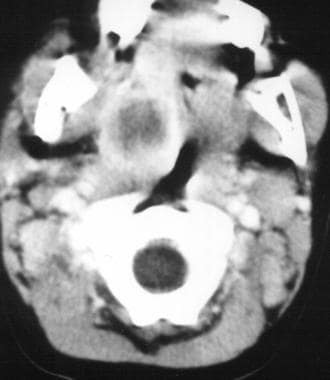 Horner syndrome may occur because of involvement of the cervical sympathetics in this space. Treatment may include anticoagulation and possibly the ligation of involved vessels. The pretracheal (ie, anterior visceral) space is enclosed by the visceral division of the middle layer of the deep cervical fascia and lies immediately anterior to the trachea. It extends from the thyroid cartilage to the superior mediastinum. Infections here are most commonly caused by perforation of the anterior esophageal wall by endoscopic instrumentation, foreign bodies, or trauma. Infections cause dysphagia and odynophagia, pain, fever, and possible hoarseness and airway obstruction. This space is bounded by the tonsil medially and the superior constrictor laterally. The anterior and posterior tonsillar pillars form the remaining borders of this space. Peritonsillar abscesses are the most common deep neck space abscess and represent a sequela of tonsillar infections. Individuals with peritonsillar abscesses typically exhibit trismus, pain, odynophagia, drooling, a "hot potato" voice, and fever. They demonstrate uvular deviation, palatal asymmetry, and displacement of the tonsil medially. Note that the tonsillar erythema and exudates may be mild despite the presence of an abscess. Patients who have had their tonsils removed effectively lose this space, but they can still develop peritonsillar pathology. Peritonsillar abscesses are most commonly managed by incision and drainage or by needle aspiration. Most commonly, interval tonsillectomy is performed 4-12 weeks after resolution of the infection. Peritonsillar abscesses may spread to the parapharyngeal space if not addressed promptly. The parotid space is enclosed by the superficial layer of the deep cervical fascia. This is an incomplete enclosure because the superomedial aspect of the gland is not covered. This discontinuity allows communication between the parapharyngeal space and the parotid space. The parotid space is crossed by the external carotid artery, the posterior facial vein, and the facial nerve. Infections in the parotid space often occur in dehydrated, debilitated patients with poor oral hygiene who develop salivary duct obstruction. Pain, edema, and erythema in the region of the parotid are typically observed with fever. Trismus is a later finding. The temporal space lies between the temporalis fascia and the periosteum of the temporal bone, and it contains the internal maxillary artery and the inferior alveolar artery and nerve. The temporalis muscle effectively divides the space into a deep and superficial compartment. Abscesses in this region are characterized by pain and trismus and may exhibit deviation of the mandible. Incision and drainage may be accomplished by an approach 3 cm lateral to the lateral canthus or by a horizontal brow incision. No absolute contraindications to surgical drainage of deep neck space infections exist. However, for patients experiencing airway compromise from the infection, the need to establish a safe airway takes priority and should be addressed before initiating any other surgical procedures. Once the airway has been secured, the surgical drainage procedure can be performed. Celakovsky P, Kalfert D, Tucek L, et al. Deep neck infections: risk factors for mediastinal extension. Eur Arch Otorhinolaryngol. 2014 Jun. 271 (6):1679-83. [Medline]. Adil E, Tarshish Y, Roberson D, Jang J, Licameli G, Kenna M. The Public Health Impact of Pediatric Deep Neck Space Infections. Otolaryngol Head Neck Surg. 2015 Dec. 153 (6):1036-41. [Medline]. Conrad DE, Parikh SR. Deep Neck Infections. Infect Disord Drug Targets. 2012 Feb 17. [Medline]. Chang L, Chi H, Chiu NC, Huang FY, Lee KS. Deep neck infections in different age groups of children. J Microbiol Immunol Infect. 2010 Feb. 43(1):47-52. [Medline]. Wang LF, Tai CF, Kuo WR, Chien CY. Predisposing factors of complicated deep neck infections: 12-year experience at a single institution. J Otolaryngol Head Neck Surg. 2010 Aug. 39(4):335-41. [Medline]. Poeschl PW, Spusta L, Russmueller G, Seemann R, Hirschl A, Poeschl E, et al. Antibiotic susceptibility and resistance of the odontogenic microbiological spectrum and its clinical impact on severe deep space head and neck infections. Oral Surg Oral Med Oral Pathol Oral Radiol Endod. 2010 Aug. 110(2):151-6. [Medline]. Adovica A, Veidere L, Ronis M, Sumeraga G. Deep neck infections: review of 263 cases. Otolaryngol Pol. 2017 Oct 30. 71 (5):37-42. [Medline]. [Full Text]. Favaretto N, Fasanaro E, Staffieri A, et al. Deep neck infections originating from the major salivary glands. Am J Otolaryngol. 2015 Jul-Aug. 36 (4):559-64. [Medline]. Daramola OO, Flanagan CE, Maisel RH, Odland RM. Diagnosis and treatment of deep neck space abscesses. Otolaryngol Head Neck Surg. 2009 Jul. 141(1):123-30. [Medline]. Alotaibi N, Cloutier L, Khaldoun E, Bois E, Chirat M, Salvan D. Criteria for admission of odontogenic infections at high risk of deep neck space infection. Eur Ann Otorhinolaryngol Head Neck Dis. 2015 Nov. 132 (5):261-4. [Medline]. Ungkanont K, Yellon RF, Weissman JL, et al. Head and neck space infections in infants and children. Otolaryngol Head Neck Surg. 1995 Mar. 112(3):375-82. [Medline]. Celakovsky P, Kalfert D, Smatanova K, et al. Bacteriology of deep neck infections: analysis of 634 patients. Aust Dent J. 2015 Jun. 60 (2):212-5. [Medline]. [Full Text]. Cordesmeyer R, Kauffmann P, Markus T, et al. Bacterial and histopathological findings in deep head and neck infections: a retrospective analysis. Oral Surg Oral Med Oral Pathol Oral Radiol. 2017 Feb 20. [Medline]. Shimizu Y, Hidaka H, Ozawa D, et al. Clinical and bacteriological differences of deep neck infection in pediatric and adult patients: Review of 123 cases. Int J Pediatr Otorhinolaryngol. 2017 Aug. 99:95-9. [Medline]. Asmar BI. Bacteriology of retropharyngeal abscess in children. Pediatr Infect Dis J. 1990 Aug. 9(8):595-7. [Medline]. May JG, Shah P, Sachdeva L, et al. Potential role of biofilms in deep cervical abscess. Int J Pediatr Otorhinolaryngol. 2014 Jan. 78(1):10-3. [Medline]. Kirse DJ, Roberson DW. Surgical management of retropharyngeal space infections in children. Laryngoscope. 2001 Aug. 111(8):1413-22. [Medline]. Marioni G, Staffieri A, Parisi S, Marchese-Ragona R, Zuccon A, Staffieri C, et al. Rational diagnostic and therapeutic management of deep neck infections: analysis of 233 consecutive cases. Ann Otol Rhinol Laryngol. 2010 Mar. 119(3):181-7. [Medline]. Tapiovaara L, Back L, Aro K. Comparison of intubation and tracheotomy in patients with deep neck infection. Eur Arch Otorhinolaryngol. 2017 Oct. 274 (10):3767-72. [Medline]. Raffaldi I, Le Serre D, Garazzino S, et al. Diagnosis and management of deep neck infections in children: the experience of an Italian paediatric centre. J Infect Chemother. 2015 Feb. 21 (2):110-3. [Medline]. Plaza Mayor G, Martínez-San Millán J, Martínez-Vidal A. Is conservative treatment of deep neck space infections appropriate?. Head Neck. 2001 Feb. 23(2):126-33. [Medline]. McClay JE, Murray AD, Booth T. Intravenous antibiotic therapy for deep neck abscesses defined by computed tomography. Arch Otolaryngol Head Neck Surg. 2003 Nov. 129(11):1207-12. [Medline]. Lalakea Ml, Messner AH. Retropharyngeal abscess management in children: current practices. Otolaryngol Head Neck Surg. 1999 Oct. 121(4):398-405. [Medline]. Hah YM, Jung AR, Lee YC, Eun YG. Risk factors for transcervical incision and drainage of pediatric deep neck infections. J Pediatr Surg. 2018 Apr. 53 (4):666-70. [Medline]. Cable BB, Brenner P, Bauman NM, Mair EA. Image-guided surgical drainage of medial parapharyngeal abscesses in children: a novel adjuvant to a difficult approach. Ann Otol Rhinol Laryngol. 2004 Feb. 113(2):115-20. [Medline]. Dabirmoghaddam P, Mohseni A, Navvabi Z, Sharifi A, Bastaninezhad S, Safaei A. Is ultrasonography-guided drainage a safe and effective alternative to incision and drainage for deep neck space abscesses?. J Laryngol Otol. 2017 Mar. 131 (3):259-63. [Medline]. Dodds B, Maniglia AJ. Peritonsillar and neck abscesses in the pediatric age group. Laryngoscope. 1988 Sep. 98(9):956-9. [Medline]. Kauffmann P, Cordesmeyer R, Troltzsch M, Sommer C, Laskawi R. Deep neck infections: A single-center analysis of 63 cases. Med Oral Patol Oral Cir Bucal. 2017 Sep 1. 22 (5):e536-41. [Medline]. [Full Text]. Huang TT, Liu TC, Chen PR. Deep neck infection: analysis of 185 cases. Head Neck. 2004 Oct. 26(10):854-60. [Medline]. Chen MK, Wen YS, Chang CC. Deep neck infections in diabetic patients. Am J Otolaryngol. 2000 May-Jun. 21(3):169-73. [Medline]. Staffieri C, Fasanaro E, Favaretto N, et al. Multivariate approach to investigating prognostic factors in deep neck infections. Eur Arch Otorhinolaryngol. 2014 Feb 13. [Medline]. Broughton RA. Nonsurgical management of deep neck infections in children. Pediatr Infect Dis J. 1992 Jan. 11(1):14-8. [Medline]. Chi TH, Tsao YH, Yuan CH. Influences of patient age on deep neck infection: clinical etiology and treatment outcome. Otolaryngol Head Neck Surg. 2014 Oct. 151 (4):586-90. [Medline]. Hidaka H, Yamaguchi T, Hasegawa J, et al. Clinical and bacteriological influence of diabetes mellitus on deep neck infection: Systematic review and meta-analysis. Head Neck. 2015 Oct. 37 (10):1536-46. [Medline]. Right lateral pharyngeal (parapharyngeal) abscess as seen on CT scan. Note the medial extension in the retropharyngeal area. Same patient as in the previous image. Lower cut CT scan showing the abscess cavity. The rim enhancement and partial loculation are well demonstrated.